Gleichwie der Regen und Schnee vom Himmel fällt (Just as the rain and snow fall from heaven), BWV 18,[a] is an early church cantata by Johann Sebastian Bach. He composed it in Weimar for the Sunday Sexagesimae, the second Sunday before Lent, likely by 1713. Bach worked for the court in Weimar from 1708. On 2 March 1714 Bach was appointed concertmaster of the Weimar court capelle of the co-reigning dukes Wilhelm Ernst and Ernst August of Saxe-Weimar. As concertmaster, he assumed the principal responsibility for composing new works, specifically cantatas for the Schlosskirche (palace church), on a monthly schedule. Bach composed this cantata for the second Sunday before Ash Wednesday, called Sexagesima. 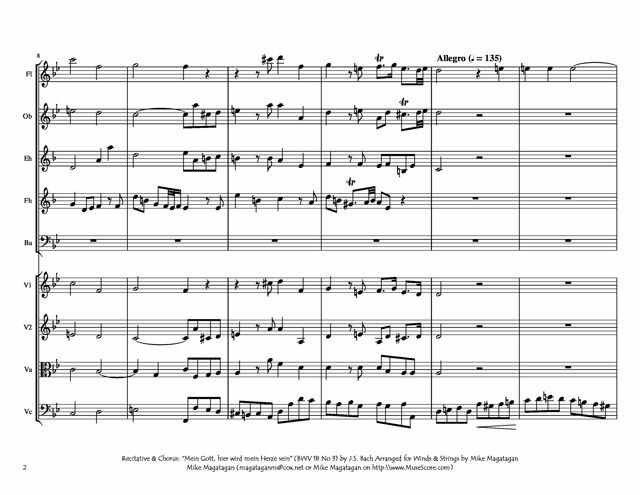 The cantata falls relatively early in Bach's chronology of cantata compositions. It was possibly composed for 24 February 1715, but more likely a year or two earlier. Christoph Wolff states: "The original performing material has survived and allows us to date the work to 1713". Bach performed the cantata again in Leipzig in 1724, with an expanded scoring in a different key. It was then probably performed in the same service as the newly composed Leichtgesinnte Flattergeister, BWV 181. The keys in this section refer to the Weimar version, although the recording by Masaaki Suzuki, with commentary by Klaus Hofmann, uses the Leipzig keys. Hofmann notes the work's "Lutheran character", quoting Luther's litany inserted in the third movement, and sees it as a "recitative study, exploring the secco recitative of the Italian opera, introduced by Erdmann Neumeister, and also the accompagnato with rich instrumental accompaniment. Gardiner finds all three cantatas for the occasion, dealing with God's word, "characterised by his vivid pictorial imagination, an arresting sense of drama, and by music of freshness and power that lodges in the memory". The cantata opens with a sinfonia in G minor, which illustrates falling rain and snow in descending phrases. In da capo form, is reminiscent both of a chaconne and a concerto. The four violas and continuo, with bassoon and cello parts specified, create an unusual sound, termed "magically dark-hued sonority" by Gardiner. The quotation from Isaiah is sung by the bass, the vox Christi (voice of Christ), in a secco recitative. 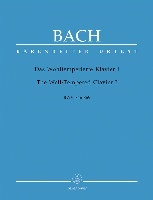 This is Bach's first adaptation of recitative in a church cantata, not following operatic patterns, but "a lucid presentation of the text in a dignified, highly personal style". The central movement is unique in Bach's cantatas, the choir soprano interrupts the prayer of the male soloists four times, followed by a conclusion of the full choir "Erhör uns, lieber Herre Gott!" 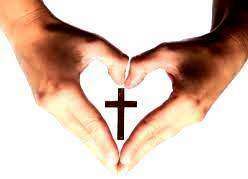 (Hear us, dear Lord God!). The recitatives are marked adagio in E-flat major, while the interspersed litany is presented dramatically (allegro in C minor). Gardiner compares the imagery of the recitatives: "all adds up to a vivid, Brueghel-like portrayal of rural society at work – the sower, the glutton, the lurking devil, as well as those pantomime villains, the Turks and the Papists. Like other cantatas written in Weimar, the cantata is scored for a small ensemble, composed of soprano, tenor, and bass soloists, a four-part choir, four violas, cello, bassoon and basso continuo. The setting for four violas is unusual. 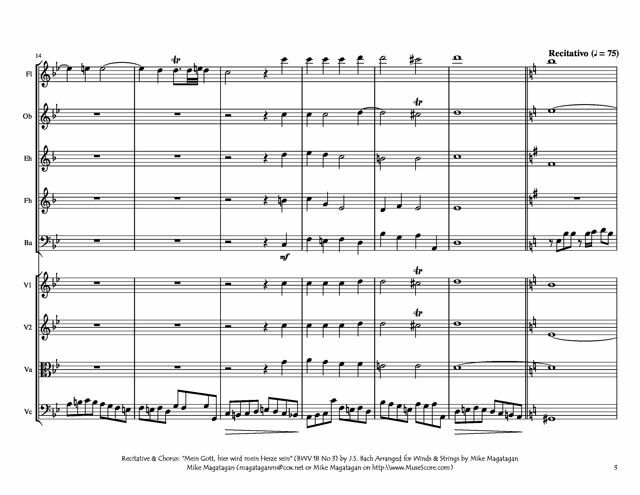 In a similar orchestration, the Brandenburg Concerto No. 6 also omits violins. The second version of this cantata for a performance in Leipzig adds two recorders, which double viola I and II an octave higher. John Eliot Gardiner compares the effect to a four-foot stop on a pipe organ. The cantata begins in G minor in the Weimar version, in A minor in the Leipzig version. 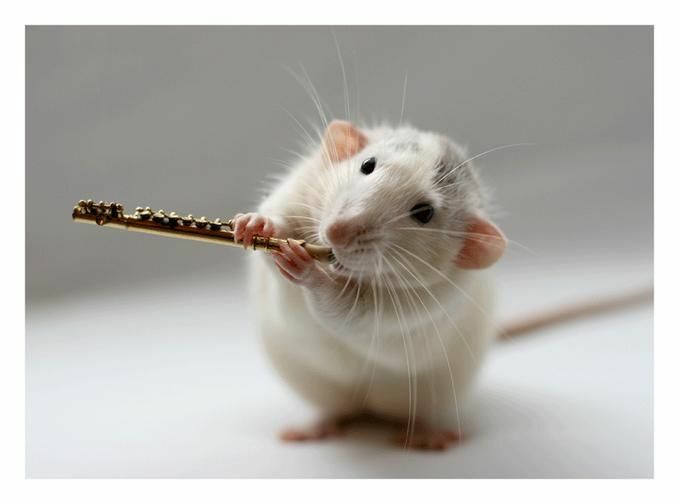 The only aria, for soprano in E-flat major, is accompanied by the four violas in unison. The cantata closes with a four-part setting of Spengler's hymn stanza, Bach's first of many to come as the typical conclusion of his cantatas. 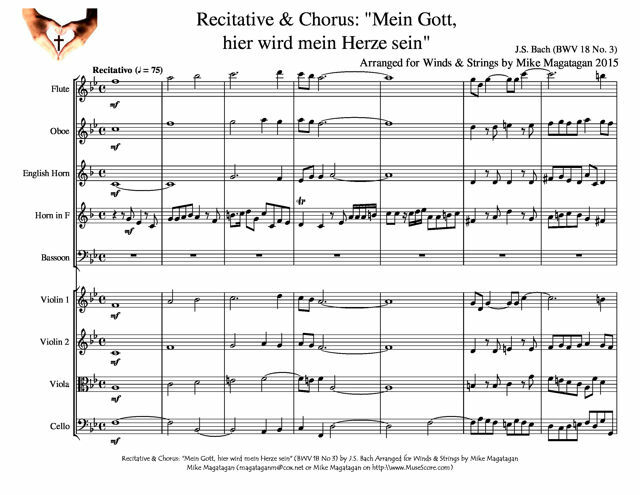 I created this arrangement of the Recitative Chorus: "Mein Gott, hier wird mein Herze sein" (My God, here is my heart) for Winds (Flute, Oboe, English Horn, French Horn & Bassoon) & Strings (2 Violins, Viola & Cello).